In the middle of Moscow River there’s an island opposite the Christ the Savior Cathedral. 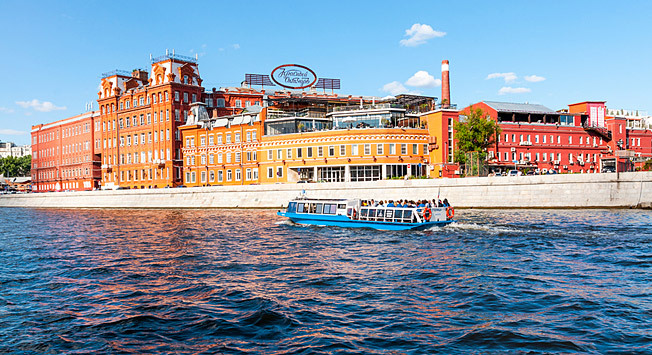 The iconic red brick Krasny Oktyabr Chocolate Factory used to be on the eastern tip. All good things come to an end, as the saying goes. Another saying dictates that when one door closes another one opens. The door that opened was to the now iconic in its own right bohemian island of art, fun and culture, comparable to hipster paradises like London’s Shoreditch area or New York’s East Village, but not without a bit of Moscow glitz and glamour. Galleries for the intellectuals and creatives, funky bars and restaurants, quirky shops and loud nightclubs have popped up all over the factory complex. Lots of galleries have come and gone but one passed the test of time: Lumiere Brothers Center for Photography offers the most interesting retrospectives of international and Russian from the modern days all the way back to the early 20th century. It’s no stranger to hosting lectures, master classes and other events for photography lovers. Another veteran is Strelka Institute which evolved over the years from a bohemian bar where hip intellectuals gathered to discuss art house and other art matters to a full blown non-governmental institute with an experimental approach and a design-heavy academic program. The best part: education at Strelka is free and often in English. Digital October has also been on the island for as long as locals can remember. Hosting a wide range of talks, webinars and international conferences in the sphere of new technologies and technology entrepreneurship, it provides a venue for Russian and foreign IT gurus and new media experts to come together and share their knowledge. Relative newcomers are Joy’s Bar and Primitivo. The former is a more “democratically-priced” alternative to the aforementioned restaurants. The food is quite varied with mostly European fare, the bar is well-stocked with all kinds of spirits and the cocktail menu is imaginative. Joys also doubles as a fun party place on weekends and the summer terrace is simply spectacular. A wine-themed spot (masterminded by Marco Cervetii) serving up dishes made to be paired with certain vintages, Primitivo allows discerning guests to truly enjoy one another’s company – and wine from all corners of the world - in a low-key, casual setting. Lunch deals are great here, especially when enjoyed in their little inner-court summer garden. One more spot worth noting is little Mizandari, which looks much smaller from the outside than it is on the inside. Friendly Georgian ladies treat guests to their country’s delicious cuisine in a rustically minimalistic setting. Red October is one of Moscow’s hottest parties spots with some of the most hard to get into clubs in town. One of them is Gipsy, freshly reopened after a 6-month restoration. This one attracts an unlikely crowd of expensively clad golden youth and hipsters and plays host to all night parties with some of the best international electronic DJs. In the summers party-goers move to the spacious terrace overlooking the statue to Peter the Great. Shakti – translated as “power” from Sanskrit – is a contemporary, progressive social and musical venue that gets you in touch with your inner Zen through smart, intellectual parties. It also has great food outside of party hours! Right under Shakti glamorous Moscovites show off what they have in Artel Bessonica, one of the trendiest clubs at the moment. Red Club is a live music venue where the baddest boys and girls come to rock out to heavy local and internationally acclaimed bands. If you didn’t have time to beautify before going out, not to fret. Ladies, the newly opened MilkAndSpice beauty studio will take care of your nails and your ‘do. Gentlemen, BoyCut can guarantee the utmost brutality and manliness when it comes to your haircut.